Everyone relies on their car to get them from where they are to where they need to be. That is why everyone hates it when they go to turn their car on and it will not start. The sense of fear, panic and anxiety can be overwhelming, especially since it always seems to happen right when you need to be somewhere. There are several options in this situation. The first is to call a friend or flag down a passing motorist and ask for a jump start, one of you need to have some jumper cables available. However this can take time, and flagging down random motorists on the street can be dangerous. You can call a mechanic or AAA, but you still have to wait for someone to show up. The solution is to purchase a portable jump starter. When you get a car jump starter that you carry in the car at all times you can be confident that no matter what happens you will always be sure that you’ll be able to get where you are going and then back home. However there are many choices when it comes picking a portable battery jumper, how can you know what the best jump starter is? We’ve assembled this list to help you pick the best portable jump starter. Some may not need to jump start any regular engine, but a massive engine. 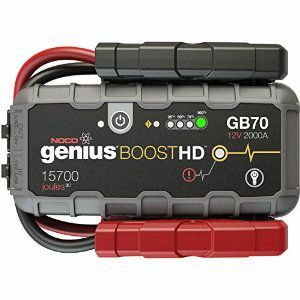 Operating at 2000 amps, the NOCO Genius Boost HD GB70 is a portable jump starter for all occasions. Designed for an up to 8 Liter gas engine or a 6 Liter diesel engine and usable on cars, trucks, and boats, it is compact and stylish, easily fitting into a glove box for safe and accessible storage. The HD GB70 also features a high powered LED light. The light operates in 7 different modes, from a steady beam to an attention getting emergency strobe effect as well as a repeating SOS signal. The HD GB70 is also incredibly fast when it comes to recharging. It takes a mere 3 hours to fill up the portable jump starter. Furthermore, the USB port on the HD GB70 can act as a charging station for any device. This includes cellphones and tablets as well as lights or hearing aids. With features like these it is easy to see how the HD GB70 can easily be considered a contender for the best portable jump starter. 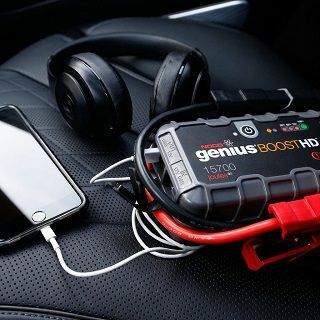 The UltraSafe lithium battery inside NOCO Genius Boost can deliver up to 20 full power jump starts per charge. Best of all, it's protected by multiple levels of safety. powered LED light which rotates on a 260 degree arch so that you can be sure that you are setting your jump start up correctly. While a dead battery is bad, crossing terminal charges could fry your car’s entire electric system. Thankfully, even without the light, the Stanley J7CS comes with a reverse polarity indicator and an alarm to stop you from trying to get your engine to turn over while the battery is hooked up incorrectly. 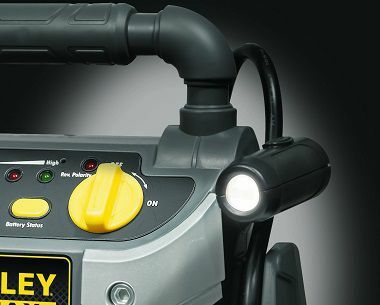 Additionally, with an attached 120 psi compressor, the Stanley J7CS lets you fill up flat tires in addition to being a conventional battery jump starter. This means that you are getting two tools for the price of one. Given this great value it is easy to see why so many customers are satisfied with the Stanley J7CS. 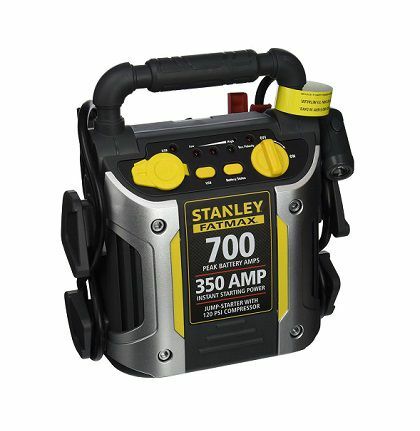 The Stanley FatMax 700a peak jump starter offers a convenient, portable way to jump start your battery without the need of another vehicle. With enough power to jump start your truck, car, motorcycle, boat, RV or tractor, the jump starter is ideal for every day use or roadside emergencies. 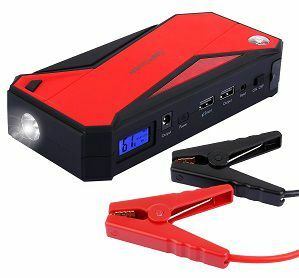 Last but certainly not least on the list is the DBPOWER 600A 18000mAh Portable Car Jump Starter. This bad boy can be used to jump start any gas engine up to 6.5 Liters or any diesel engine up to 5.2 Liters. With such a vast range there is hardly an engine on the market that cannot be started with the DBPOWER 600A. All this is a size that can fit in a glovebox. The DBPOWER 600A also features a smart charging port that allow you to fill up your electronic devices. This can be a life saver in an emergency, or just a great way to make sure you never miss an important phone call. This is not the only high tech feature though, as the DBPOWER 600A also features an LCD screen that shows the remaining power in the battery and also displays a compass for emergency navigation or to give directions to your location. The DBPOWER 600A also has its bases covered when it comes to safety. It features a host of protective measures including over load protection, over-charge protection, over current protection, short circuit protection and much much more. With all of this safety you can use the DBPOWER 600A knowing that your car and electronic devices are in safe hands. 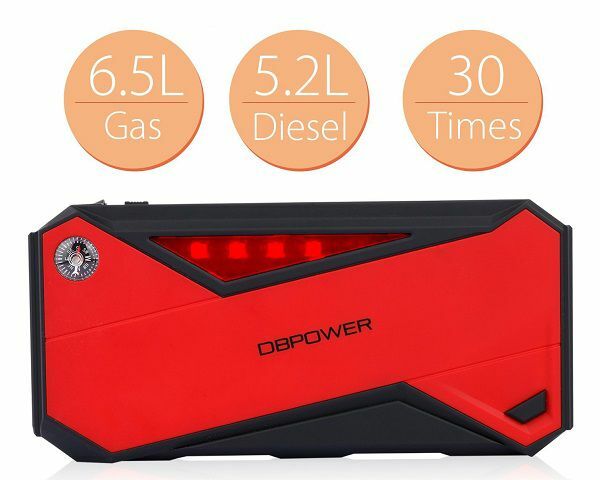 Given its versatility and size it is no wonder why the DBPOWER 600A is considered a strong candidate to be the best portable car jump starter. A must have for every car! Make sure you and your loved ones can get home when stranded. It will jump start 6.5L gas or 5.2L diesel engine up to 30 times on a single charge. The Anker Compact Car Jump Starter really lives up to the compact in its name. It is small enough to carry with you in a bag. Therefore you can feel safe in the rental car that you have let knowing that you can get it going if you have to. The small size of the Anker does not mean it lacks in power. It can be used to jump a 3 Liter gas or a 2.5 Liter diesel engine up to 15 times on a single charge. This range covers the vast majority of personal and even commercial vehicles and so will almost certainly provide you with great value. 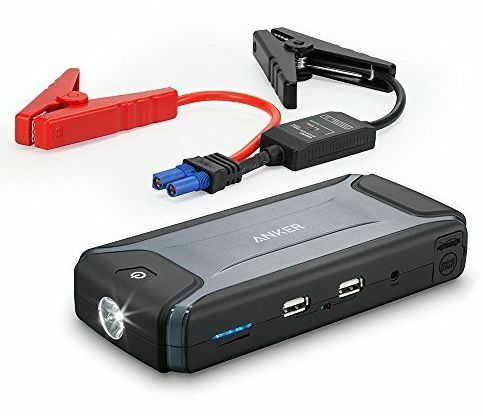 Additionally, the Anker Compact Car Jump Starter has two powerful USB ports that can be used to charge a wide variety of personal items that you may need for convince or emergency. With its compact size this means that you can carry it with you and never again worry about your phone or tablet going dead or where you are going to find a place to charge your phone. Finally, the Anker Compact Car Jump Starter ranks high in terms of the safety it provides. The Anker is specifically engineered in order to avoid causing short circuits, surges, or inverted currents. This means that you can use the Anker feeling secure that nothing will go wrong. 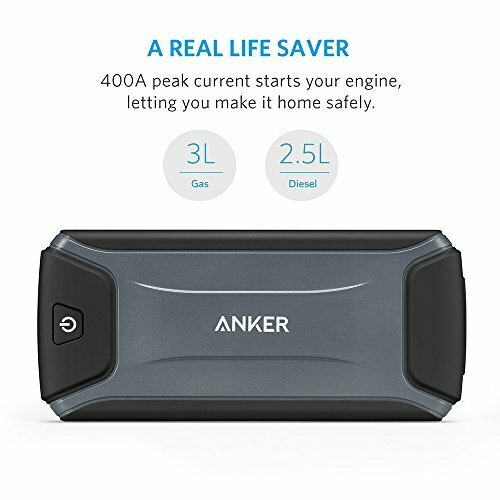 Considering the light, compact and portable nature of the Anker, combined with its numerous features, it is clear to see why many make the case that it is the best portable car jump starter on the market. Make sure you and your loved ones can get home when stranded. This will jump your 3L gas or 2.5L diesel vehicle engine around fifteen times on a single charge. .
As you can see, there are many different options for car jump starters, but these are some of the best options available on the market. You should make your decision based on your needs. Determine how big your engine is, and determine your desire for features such as lighting, number of charging ports, compact size and the ability to refill tires as well. Then check out the prices and delivery options of the different models above. With a little bit of comparison it should be no problem to determine which is the best portable car jumper for you. Once you have your portable car jumper you can rest easy, safe and secure in the knowledge that no matter what, your car will always start.